I ran this post about five years ago. It’s running again because the painting featured is a favorite of mine. But more than that, it seems to fit this time as well as any current artwork. I have added a quote from John Updike commenting on some of the works of the artist, Martin Johnson Heade. He points out attributes in Heade’s landscapes that I hope to find in my own work. I don’t think I’ve ever mentioned Martin Johnson Heade here. This is really an oversight on my part as some of his work was really influential on the direction of my work early on, even though to the casual observer it may not seem apparent. After all, our styles and methods of painting were wildly different. The intensity of the color and contrast in his paintings of the floral subjects and tropical birds that he completed during his long and prolific career (born 1819 and died in 1904) really made me want to push my own color ahead. There is a site, Martin Johnson Heade- The Complete Works, that has his complete works online where you can see the great quality of his color and use of contrast. 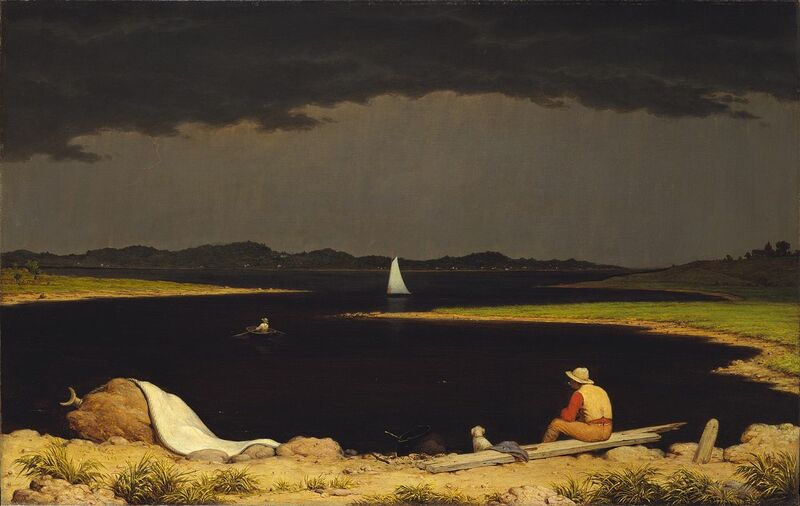 But the painting shown at the top, Approaching Thunderstorm, from the Metropolitan Museum is my favorite Heade painting. The forms of the black water of the lake set against the vibrant color of the shoreline is striking and a most ominous storm cloud churns toward the boaters who have not yet fully heeded the signs of the oncoming storm. It was painted in 1859, in the years before our country exploded in civil war. This painting was part of a cultural movement of the time that depicted the tension gripping our nation in metaphorical terms. The metaphor is strong and obvious in this painting with the dark band of the river symbolizing the division between the pro-slavery/states rights factions and the abolitonist/republican side. Several prominent abolitionist preachers of the era owned versions of this painting, many often referring to this coming storm in their sermons. Knowing this makes me appreciate the painting on a different level. But it is still about the sheer emotional impact of the color and forms that hit me long before I knew its history. There is a tension and that feeling of stillness that occurs in the moment just before action occurs, something I have tried to capture in my own work at times. I still find this piece brilliant and inspiring.